Maple Syrup: Can you produce your own? If you’ve ever wanted to produce your own homegrown sweetener, maple syrup is a great choice. Although sap runs in late February and March, now is the time to start planning because it’s easier to recognize the trees when they have leaves on them. It is also easier to purchase supplies, as many suppliers run out of everything in the midst of sugaring season. Here’s an excerpt from the second edition of Homegrown and Handmade with more details to help you get started. Our homestead has grown in ways I never would have imagined when we moved here in 2002. I only wanted a garden, some fruit trees, a couple of goats for cheese, a few hens for eggs, and some sheep for wool. Creating our own cooking fats or sweeteners was not on my radar. Then one February, a friend’s maple tree lost a limb in an ice storm. When she saw sap dripping from the limb, she decided to collect it and boil it down. Although it only amounted to a few tablespoons of syrup for her, it was the impetus for me to start looking into how to make maple syrup. If she could figure out how to make a little syrup on the spur of the moment, I figured that with some preparation we could make enough maple syrup to meet our needs. I spent the next year identifying the trees on our farm to figure out which ones were sugar maples. The next winter, I bought a maple syrup starter kit and waited for early spring when the temperature would be below freezing overnight and sunny and in the 40s during the day. 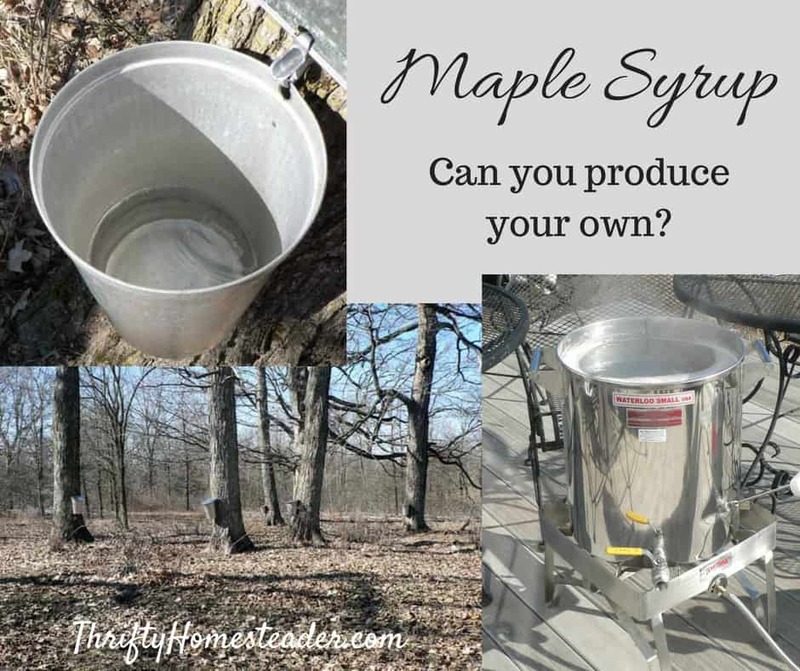 If you have even one maple tree in your yard or on your farm, and your climate is right, it is worth your time to make your own maple syrup. We’ve been tapping ten trees for the past seven years, and we can make three to five gallons most years, which amounts to one or two quarts per tree. Illinois is not the best state for maple syrup, however, because we don’t have the long spring that states like Vermont have. One year we produced less than a gallon of syrup because we only had three or four warm sunny days with overnight freezing temperatures. If you live in one of the famous maple syrup areas, you will have a much longer harvest season than we do. Obviously you need maple trees, but they have to be mature maple trees. You can’t plant maple trees and expect to harvest in a few years like you can with fruit trees. If the diameter of your trees is 10 to 17 inches, you can put one tap in the tree. You can put two taps in the tree if it is 18 to 24 inches in diameter, three taps if it is 25 inches or larger. However, we always get the best sap flow on the south side of the tree because that’s the side the sun is warming up. Because we have more trees than we have taps, we just put one tap in each tree on the south side to get the most sap. There are other trees that can be used to make syrup, such as birch and walnut, and you can even use sap from maples other than the sugar maple. However, the sap from sugar maples is the sweetest of the maple trees, hence the name, so it takes less sap to make syrup than if you used sap from other types of maple. You don’t see birch and walnut syrup being sold commercially because the sap has to be boiled down for so long that it’s not profitable. If you see unusual tree-name syrups and read the ingredients, you often see that it is actually flavored corn syrup. If you have these trees on your property, however, you might want to try making syrup from them. If you have a grove of black walnut trees for lumber, tapping the trees may ultimately reduce the value of the wood because the tap will leave behind a scar. The only specialized equipment you absolutely must have is tree taps and buckets for collecting sap, so you can get started for less than the cost of a quart of store-bought maple syrup. Keep in mind, however, that life will be better if you have a way to boil down sap outside. Maple syrup cooks down from sap at a ratio of somewhere between 33 to 1 and 40 to 1, depending upon how sweet the sap is. That means that we have to collect 40 gallons of sap to make 1 gallon of syrup. If you boil down that sap in your house, you will be dumping 39 gallons of sap into the air of your house. There are stories of wallpaper falling off walls when people tried to boil sap in their house. We have a ten-gallon pot that was sold as a turkey fryer, which we use outside to boil down sap. If you are planning to make enough maple syrup that you will need to store it at room temperature, then you really should have a hydrometer so that you will know when the syrup is at 66 Brix. (The Brix scale indicates the percentage of sugar in the maple syrup.) If you don’t have that handy little instrument, you should probably stop boiling a little early. The only down side to not boiling the sap long enough is that it will mold if kept at room temperature. However, if you boil too long, you could wind up with burned maple sugar in your pot, which means you lose both your syrup and your pot.